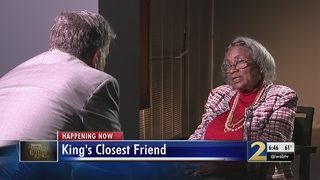 Mrs. Abernathy says her husband's life was forever impacted by Dr. King's assassination. after he cradled his best friend, his partner and frequent cellmate in the Civil Rights Movement. "He grieved as though he had lost a blood brother. He really mourned," Mrs. Abernathy said. Mrs. Abernathy says the two men knew each other as students in Atlanta even before Rev. Abernathy helped usher Dr. King into the forefront of the Montgomery Bus Boycott when both were young pastors in 1955 and two years later they led the founding of the Southern Christian Leadership Conference together. That same night she indicated her home was bombed. "It was a God-fearing effort," she said.